Back from a particularly rectifying weekend. 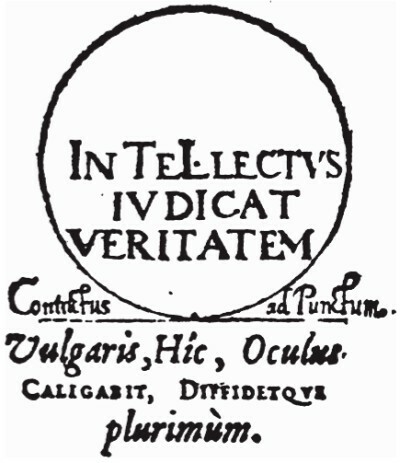 Hence an etching from Basil Valentine‘s 1603 Occulta philosophia, again reproduced in Fabricius (see previous post). 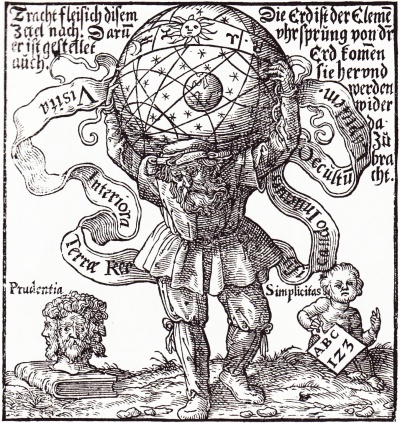 The figure presents Valentine’s “vision of the great stone, the Benedictine superman supporting as Atlas the cosmic globe with its multitude of stars, the earth occupying the centre. The Sun is in Pisces, the moon in Aquarius, the circular work at its end. The inscription reads: ‘Seek this poster with diligence: therefore it has been shown to you. The earth is the source of the elements; they come forth from the earth and return to it again.’ The flying scroll is inscribed: ‘Visit the interior parts of the earth; by rectifying thou shalt find the hidden stone'” (p208). “The three-headed bust of an antique philosopher conveys ‘prudence,’ the infans philosophorum with ABC ‘simplicity.’ The union of these modes testifies to the Benedictine’s attainment of the highest lucidity of which the human intellect is capable. The state of mind is that of child and genius. Says an alchemical treatise: ‘The work is not brought to perfection unless it ends in the simple… for man is the most worthy of living things and nearest to the simple, and this because of his intelligence’ [Liber platonis quartorum]” (p208). While studying both with the utmost diligence. That my day’s wages may follow soon. 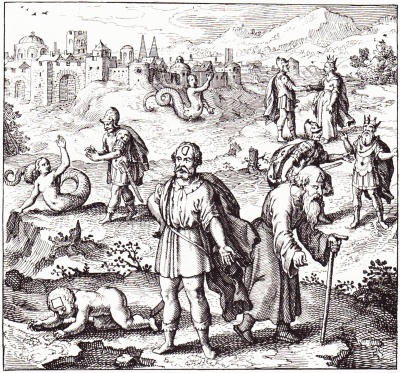 “The stone… may be amplified by a passage in the ‘Rosinus ad Sarratantam Episcopum,’ one of the oldest alchemical texts in Arabian style: ‘This stone is below thee, as to obedience; above thee, as to dominion; therefore from thee, as to knowledge; about thee, as to equals… This stone is something which is fixed more in thee [than elsewhere], created of God, and thou art its ore, and it is extracted from thee, and wheresoever thou art it remains inseparably with thee… And as man is made up of the four elements, so also is the stone, and so it is [dug] out of man, and thou art its ore, namely by working; and from thee it is extracted, that is, by division; and in thee it remains inseparably, namely by knowledge. [To express it] otherwise, fixed in thee: namely in the Mercurius of the wise; thou art its ore: that is, it is enclosed in thee and thou holdest it secretly; and from thee it is extracted when it is reduced [to its essence] by thee and dissolved; for without thee it cannot be fulfilled, and without it canst thou not live, and so the end looks to the beginning, and contrariwise’ [Artis aurif. ]” (p208). Three etchings reproduced in Johannes Fabricius’s Alchemy: The Medieval Alchemists and Their Royal Art. Emblema XXXIX of Michael Maier’s 1618 Atalanta fugiens (see earlier post). “The foreground figures illustrate the riddle of the Sphinx: What is that which walks on four in the morning, on two at noon, on three in the evening? Answer: Man. The geometrical signs inscribed on the three foreground figures refer to the opus and to the composition of the philosopher’s stone [says Maier]: ‘The true meaning is: first one should consider the square, or the four elements; from there one should advance to the hemisphere, which has two lines, the straight and the curved one, representing Luna, who is made white; after that one should pass to the triangle, which consists of body, soul, and spirit, or Sol, Luna, and Mercurius'” (p32). Basil Valentine‘s Tenth Key, 1599. The Latin inscriptions read: ‘I am born of Hermogenes. Hyperion elected me. Without Jamsuph I am compelled to perish’. The above “shows Basil Valentine’s emblem of the third coniunctio and the production of the stone. Its trinitarian design merges the sun and moon (top corners) in the sign of Mercurius philosophorum (bottom corner). 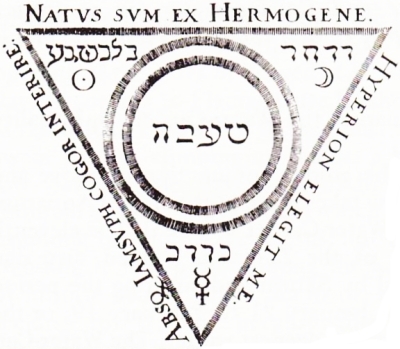 The Trinity is inscribed with a radiant double-circle… symbolizing the philosopher’s egg. Its ‘nesting’ in heaven is expressed by the name of the Highest inscribed in the stone’s centre”. “Basil Valentine’s ‘election’ by Hyperion is a reference to solar rebirth, Hyperion in Greek mythology representing the Father of the Sun. The text reads: ‘In our stone, as composed by me and by those who have long preceded me, are contained all elements, all mineral and metallic forms, and all the qualities and properties of the whole world. In it we find the most powerful natural heat, by which the icy body of Saturn is gently transmuted into the best gold. It contains also the highest degree of cold, which tempers the fervent heat of Venus and coagulates the living Mercurius, which is thereby also changed into the finest gold. The reason for this is that all the properties are infused by nature into the substance of our great stone, and are developed, perfected, and matured by the gentle coction of natural fire, until they have attained their final perfection'” (p165). 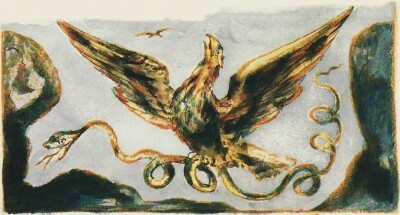 Emblema XXI of Michael Maier’s 1618 Atalanta fugiens. ‘Here followeth the Figure conteyning all the secrets of the Treatise both great & small’. “Above, the alchemist performs the squaring the circle [see earlier post], thereby turning the two sexes into one. 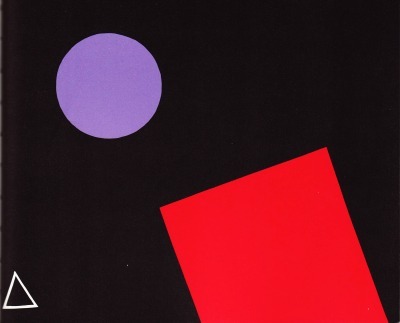 The motto repeats a saying of the ‘Rosarium’: ‘Make a circle out of a man and woman, derive from it a square, and from the square a triangle: make a circle and you will have the philosopher’s stone.’ As informed by the text, the triangle denotes the unity of body, soul and spirit. Of this operation Petrus Bonus says: ‘In this conjunction of resurrection, the body becomes wholly spiritual, like the soul herself, and they are made one as water is mixed with water, and henceforth they are not separated for ever, since there is no diversity in them, but unity and identity of all three, that is, spirit, soul and body, without separation for ever'” (p198). Two prints by William Blake from his c. 1790 The Marriage of Heaven and Hell, reproduced in The Illuminated Books of William Blake, Volume 3.
whereas it now appears finite & corrupt. all things thro’ narrow chinks of his cavern. men, who built palaces in the immense cliffs. raging around & melting the metals into living fluids. 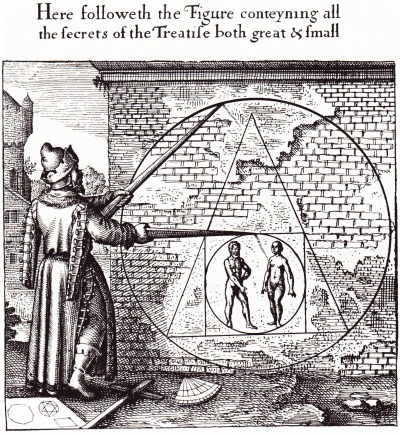 A figure from John Dee‘s 1564 Monas Hieroglyphica (see Latin scans, English translation by Hamilton-Jones). InTeLlectus iudicat veritatem. Contractus ad Punctum. Vulgaris, Hic, Oculus caligabit, diffidetque plurimum. Which Josten translates, “Intellect judges the truth. Contracted to a Point. The vulgar eye will here be blind and most distrustful” (Ambix XII, 1964). 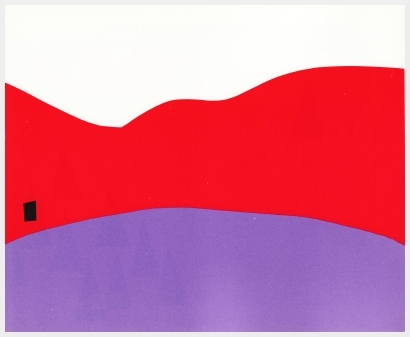 Three illustrations by Molly Bang from Picture This (1991). “Pictures are two-dimensional, whereas we live in three-dimensional space, with many more dimensions added by our passions and intelligence. When we translate or reform our multifaceted experiences into this flat, rectangular format, we play with space” (p114). “The edges and corners of the picture are the edges and corners of the picture-world” (p88). “I find that when I cover up the red shape in [the above] picture, the space becomes much flatter. It’s only when I see the red box break out of the frame that I’m aware that the other two objects can escape it, too” (p88).